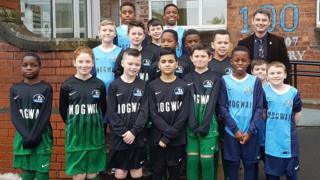 Rock band Mogwai have become the shirt sponsors of a primary school football team in Glasgow. The band bought several sets of strips for youngsters at St Roch's Primary and Deaf School in Roystonhill. The school tweeted a picture of the young players in their new kit with the message: "They look amazing. We can't thank you enough." Mogwai guitarist and singer Stuart Braithwaite then replied: "So happy about this." The band formed in Glasgow in 1995 and have recorded nine albums, including last year's release Every Country's Sun. Their debut album was called Mogwai Young Team. The school's post on Twitter prompted requests from some fans about the strips being available to buy in adult sizes. St Roch's replied to say they were "exclusive to The Young Team of St Roch's Primary". The band's drummer, Martin Bulloch, told BBC Radio Scotland's John Beattie that he had known the school's depute head for many years. He added: "He just texted me in November and said that the kids had been at a tournament and they were in some old kit and he was looking to get them some new stuff. "He asked if we could help out. I emailed the rest of the boys and they were delighted to do so. "There is nothing in the school budget for stuff like that so you can only imagine what they were kicking around in - old kit from years ago." Mogwai are the latest in a long line of bands who have sponsored football teams. In 1993, Wet Wet Wet became the shirt sponsors of their local team, Clydebank, while fellow Scottish bands Biffy Clyro and the View have previously sponsored Bonnyton Thistle Under-9s and Dryburgh Athletic Under-11s respectively. Elsewhere, comedy rappers Goldie Lookin' Chain sponsored their local team, Newport County, during the club's Welsh cup campaign in 2004 - which saw the team run out in bright gold shirts, complete with a gold medallion motif around their necks. The Greenbank under-10s 'B' team in Lincoln secured the backing of heavy metal legends Motorhead in 2006 in a deal that must have left the 'A' team feeling pretty jealous. And in 1996, ska band Bad Manners had their name emblazoned across Margate FC's shirts after singer Buster Bloodvessel took a place on the club's board. The eccentric frontman was reported to have owned a hotel in the town at the time which catered solely for overweight guests.